Buttermilk Biscuits with Gravy and Pork Sausage Crumbles. A delightful breakfast consisting of fluffy biscuits smothered in a creamy sausage gravy. Mountain House Pouches - Pack light. Eat right. With our easy-to-prepare stand up, zipper pouch, it's never been easier to make a great tasting meal! Simply open, pour in boiling water, and zip. Then eat right out of the pouch. INGREDIENTS : Buttermilk Biscuits (enriched bleached flour [wheat flour, malted barley flour, niacin, iron, thiamine mononitrate, riboflavin, folic acid], shortening [palm oil, mono and diglycerides, polysorbate 60, citric acid], buttermilk solids, baking powder [sodium acid pyrophosphate, sodium bicarbonate, cornstarch, calcium sulfate, monocalcium phosphate], sugar, salt), *Pork Patty Crumbles (pork [salt, spices, sugar], textured vegetable protein [soy flour, salt]), Gravy Mix (modified corn starch, palm oil, buttermilk powder, nonfat dry milk, corn syrup solids, spices, sugar, yeast extract, salt, sodium caseinate, disodium inosinate and guanylate, dipotassium phosphate). 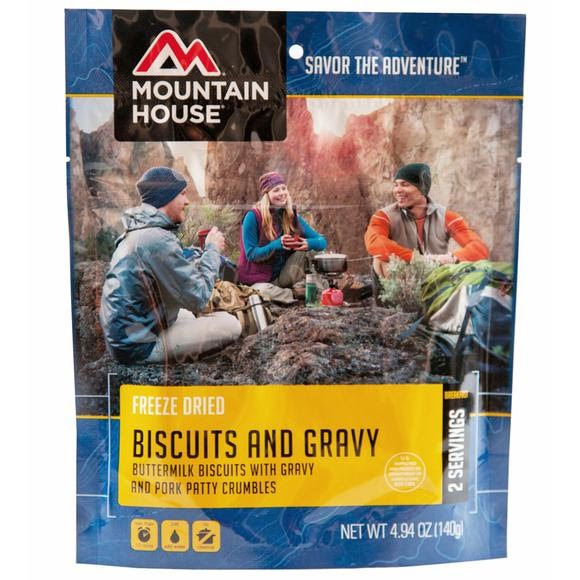 *Freeze Dried. CONTAINS: Milk, Soy, Wheat.